The co-founder of Black Lives Matter Toronto Chapter on how racism upends and unsettles. Racism is a reality for many Canadians of colour, and its effects can be damaging physically and psychologically. We asked Canadians to share their experiences of racism, self-care, self-love, and "paying it forward" for real change. Janaya Khan is one of the organizing members of Black Lives Matter, Toronto Chapter, helping to coordinate a number of demonstrations across the city in response to high profile anti-Black police violence and murders in the U.S and Canada. Khan writes and speaks internationally on issues of anti-Black racism, state violence, human rights and social action. What effect does repeat experiences of racism have on your well-being? A couple of years ago, I stepped onto a bus in Toronto and as I walked past, a white man sitting on the bus called me the n-word. It was abrupt, antagonistic and violent. He proceeded to yell racial slurs and eventually stepped off the bus. No one intervened while he yelled and no one checked in with me about whether or not I was OK. Being invested in social justice and doing this work feels like I am even more acutely aware of how violent and insidious racism is, from the continuous misspelling and mispronunciation of my name, to people touching my hair to living in a time where a movement like Black Lives Matter has to exist at all. It is in the appropriation of blackness to the public indictments of black children who are blamed for police murdering them, to mass incarceration across North America. Being a boxer, you learn the sweet science, understand the combinations, have all the tools to be in the ring and know that you’re going to take some hits, but the punch that hurts is the one you didn’t see coming. We live in an imperialist, white-supremacist, capitalist, hetero-patriarchy, and I am a black, queer, gender non-conforming person that does politically conscious work. I have learned, anticipate and understand the ways that racism and anti-black racism are systemic and institutionalized, have the skills and tools to identify, challenge and aim to dismantle those same systems of power. Yet every time racism rears its ugly head it still feels like the punch you didn’t see coming. That punch feels unbalancing, it ricochets throughout my body and shakes my sense of control. The difference is that in boxing, getting into the ring is my choice. I decide and consent to it. The violence of racism is the absence of choice. What is the relationship between self-care and working toward change? Self-care for me is an embodiment of my politic. It is not a prioritization of the self so much as a collectivized understanding of care and a centralization of blackness. When I am shutting down a highway, or sharing food in my community, boosting a homie’s project or crashing a police board meeting, those are acts of radical self-care. Boxing is another way that I practice self-care and a skill set that I share with my community ... What I have learned in the ring, I practice in my activism. 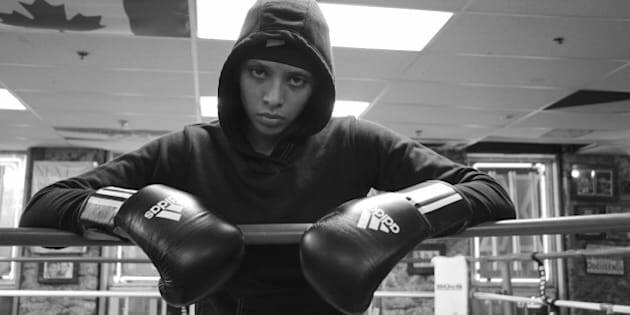 The first rule of boxing is protect yourself at all times, and as someone who is black and socialized as a woman, that is a revolutionary frame of mind. Janaya Khan is one of the organizing members of the Toronto chapter of Black Lives Matter, and has helped to coordinate demonstrations across the city in response to high-profile, anti-Black police violence and murders in the U.S and Canada. Khan, also an amateur boxer, is shown here at Bloor Street Boxing in Toronto, January 2016. This interview has been condensed from its original format.